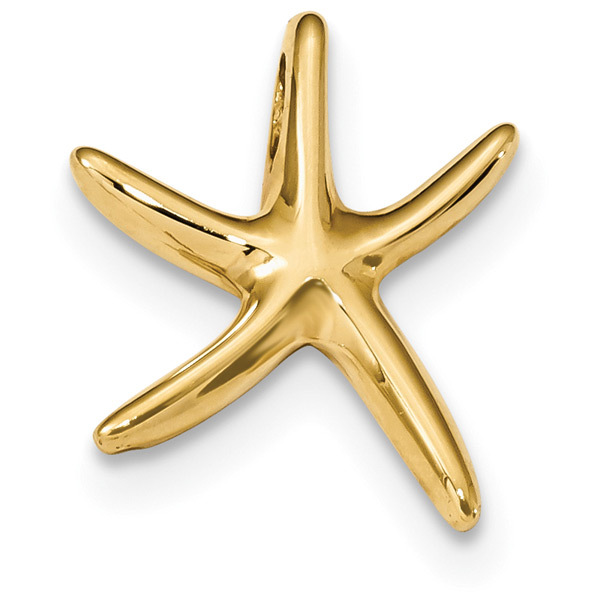 A 14k solid gold starfish slide necklace crafted in the U.S.A., from Apples of Gold Jewelry. The starfish slide measures just under 3/4" in size and has a hidden bail behind the top of the starfish pendant to slide your chain through. Add a 14k gold box chain in 18" or 20" or wear it with a chain necklace of your own. The pendant is polished / plain finished with a 3-d look that looks finished on both sides of the pendant. We guarantee our Starfish Slide Necklace in 14K Gold to be high quality, authentic jewelry, as described above.